Visitors look out towards the iron ore excavation pit at the Sishen open cast mine, operated by Kumba Iron Ore Ltd., an iron ore-producing unit of Anglo American Plc, in Sishen, South Africa, on Tuesday, May 22, 2018. Kumba Iron Ore may diversify into other minerals such as manganese and coal as Africa’s top miner of the raw material seeks opportunities for growth and to shield its business from price swings. Photo by Waldo Swiegers, Bloomberg. Anglo American Plc has quietly become a commodities trader. Anglo’s move into trading goes against a long-standing industry maxim: miners don’t trade. For much of the last two decades, investors wanted producers’ shares to track soaring metals prices and resisted anything that might get in the way. The orthodoxy was challenged when Glencore Plc broke into the big leagues of global mining with the acquisition of Xstrata in 2013, roughly when Anglo started building its trading unit. From there, it made sense to buy and sell minerals produced by others as well, and the company could even go a step further and start taking financial bets, in addition to trading the physical metal, he said. Last year, $6.6 billion of commodities flowed through Anglo’s main marketing business, generating $92.6 million in profit. 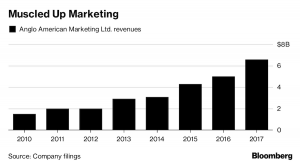 Marketing added $400 million to core profit by 2016, up from nothing in 2013, and the company is aiming to more than double that. Less than 10 percent of Anglo’s mined production is now sold through dedicated trading companies, from 60 percent in 2013. Anglo wouldn’t give more details about its trading results other than to say the businesses met a target of adding $400 million to underlying earnings by 2016 a year early, and the figure is now significantly higher. 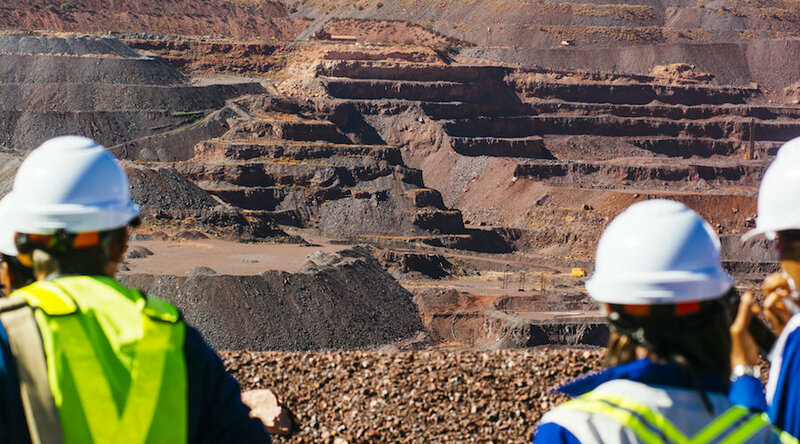 The most recent filings show that its main marketing business, platinum marketing unit and South African iron-ore marketing unit reported combined profits of about $400 million, though these numbers do not fully reflect the impact of the business which also increases returns at the mining asset level. Trading can mean different things to different companies — from simply trying to be smarter about how they sell and ship their commodities to customers, to a full-scale operation buying and selling commodities produced by others as well as making speculative bets in physical and derivatives markets. BHP Billiton Ltd., the world’s biggest miner, has been trading its own commodities for years. Following Anglo’s success, No. 2 miner Rio Tinto Group has just reorganized its marketing division in an effort to catch up. While Anglo is unusual among major miners by moving into commodities trading, it’s still a bit player by global standards. Glencore says it traded 4 million metric tons of copper metal and ore last year, compared to production of 1.3 million tons. Anglo, on the other hand, last year traded 111,000 tons of copper from third parties on top of its own production of 579,000 tons. BHP has been thinking seriously about how it sells its own commodities since the early 2000s, but the company says it doesn’t see any value in trying to compete with traders like Glencore. The company’s trading business is focused on procurement, where it spends more than $13 billion each year on everything from diesel and diggers. BHP has more pricing power by centralizing its buying than when individual mines bosses were left in charge. A benefit the miners are less keen to highlight is that handling marketing in a low-tax jurisdiction like Singapore also helps to lower their tax bill. But Balhuizen insists that BHP pays its fair share, arguing that it’s increased the value of its assets through the trading unit. Rio, meanwhile, is scrambling to catch up. When CEO Jean-Sebastien Jacques took the helm in 2016, he found the company trailing behind its rivals as far as trading goes. This year the company launched its own marketing hub in Singapore with about 450 people. So far, Rio seems to be replicating BHP’s approach, saying it wants to partner with customers and suppliers. George Cheveley, natural resources portfolio manager at Investec Asset Management and a former market analyst at BHP Billiton, said that Anglo and Rio were on the same path that the larger miner had already trodden. "They’re doing what BHP started doing back in 2003-04: it’s basically just being commercially sensible," he said. Going beyond that may not be wise, he added. "If you want to trade, you need a mix of downstream and upstream assets. That’s what the oil majors have, what Glencore has, and the other miners don’t — that’s why I don’t think the miners should be trading." (By Thomas Biesheuvel and Jack Farchy).